It was so beautiful here in Vermont yesterday I opted to go for a kayak rather than go to the market after work and didn’t get home until after eight. It’s for times like these that I make sure I always have a couple of jars of Rao’s Marinara, fresh parmesan, and a variety of pasta on hand. I dug around and found a package of hot Italian sausage in the freezer and some mushrooms in the fridge…perfect. I put the frozen sausages on the bbq over low heat with the cover closed until they began to soften up at which point I turned up the heat and grilled them evenly on all sides. Before pouring the Marinara into my pot I added some extra virgin olive oil, a sprinkling of red chili flakes, and after a minute to give enough time for the chili flakes to impart their flavor I threw in my mushrooms which I had cut into thick slices. It took about five minutes for the mushrooms to soften and I then added the jar of sauce. 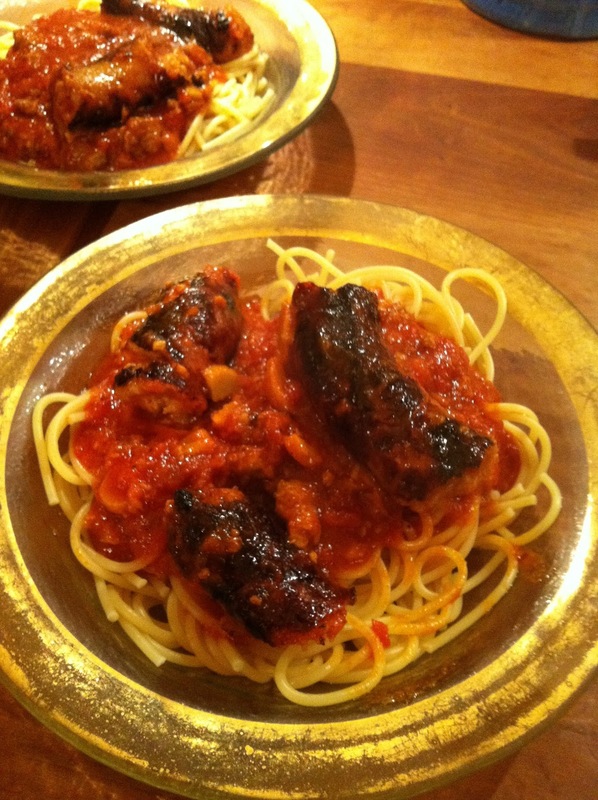 With the sausages nearly cooked I pulled them off the grill and put them right into the sauce where they simmered for about five minutes at which time my thick spaghetti was cooked and drained. The possibilities for this are endless, bacon, canned garbanzo or white beans, frozen peas or edamame, sliced olives, capers, anchovies, pesto, ingredients I always like to have around. But the key is to always have the Rao’s and pasta in the pantry.